In an effort to give the teachers something handmade this week and simultaneously make room for new fabric, I decided to make all four of my boys teachers plus the headmistress & her assistant (headmistress sounds pretty fancy for pre-school, huh?) 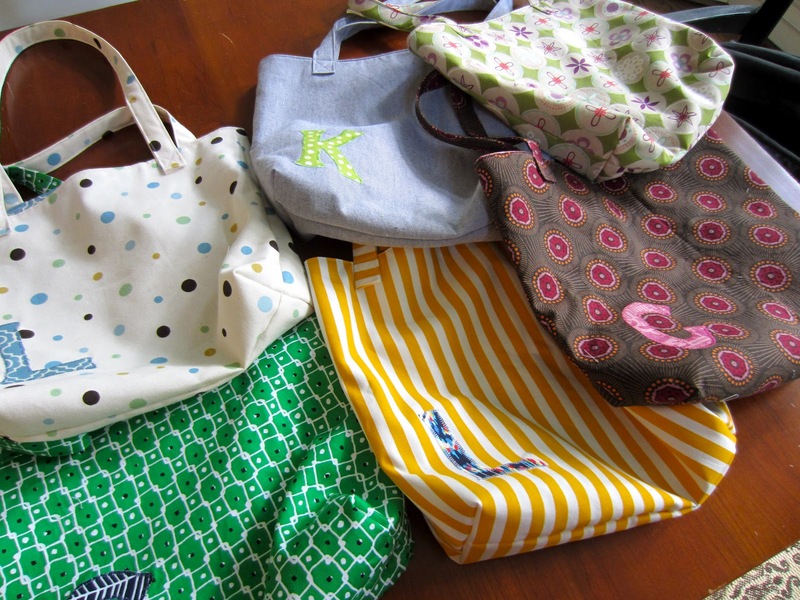 some tote bags. I used my Tote Bag 101 tutorial, but slightly shrinked down to 14" x 16" and added a first name letter monogram. I used heat n' bond for the letter in the lining fabric and did a simple zig zag stitch around it. Some fabrics were busy, like these Melody Miller and Anna Maria Horner prints. Some more plain, in a chambray from the Lisette collection at JoAnn's. This one is in a yellow & white canvas remnant I got at Ikea. I love the ikat print from Amy Butler I used on the lining & letter (Kasbah in Midnight). I had visions of photographing them all hung up together on my kitchen cabinets, but that did not work at all! I'm just glad I finished in time. I definitely had the method down pat by the sixth one. I hope they have a nice Teacher Appreciation Week, they certainly deserve it! They look fabulous! I love the monogram on each one. I am thinking about making bags for G's teachers this year too. Guess I better get going! PS: the CLTMQG meeting this month is the 24th. :) I had to switch it b/c the room was not available. These are so cute! Lucky Teachers!